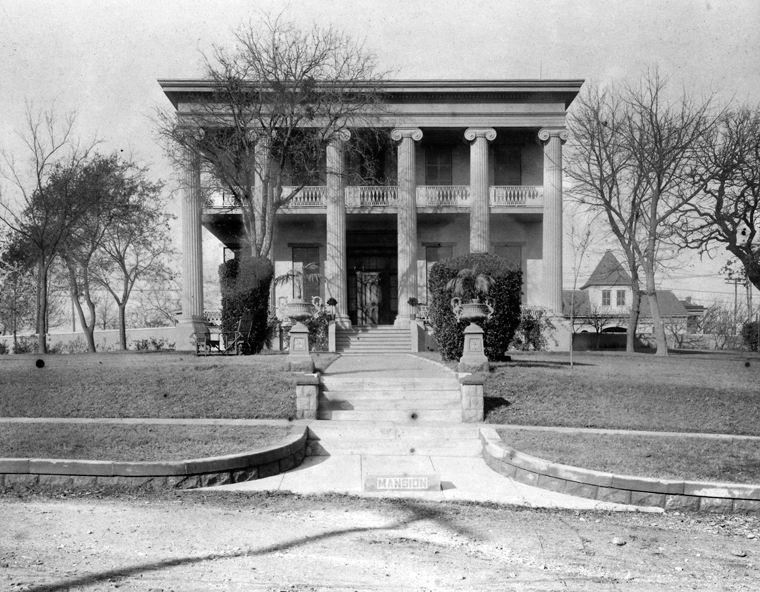 The Mansion's history began with a $14,500 appropriation from the legislature roughly a decade after Texas became a state in 1845. The construction contract was awarded to Austin master builder Abner Cook who adopted the popular Greek Revival style of architecture for the home. Cook was a man of great vision, and even better resourcefulness. He owned a clay pit on the Colorado River not too far from the construction site, which he used to mold the very bricks that sustain the Mansion's walls today. The design for the house included a deep veranda, floor-length windows and wide hallways to allow breezes to pass through and cool the house - a summertime necessity here in Texas. The "X-and-Stick" railings on the porch were a trademark of Cook's. Four main rooms were crafted on each floor, two on each side of a broad central hall. Finally, six 29-foot Ionic columns were erected to span the front porch, adding the finishing touches to the stately residence. In the years that followed, a wealth of colorful stories came to life within this home, and the memories created within the walls are priceless. And so are the collections of art and antiques. Before the Mansion was closed for an extensive maintenance project in October 2007, the home housed countless valuables including Sam Houston's mahogany four-poster bed, Stephen F. Austin's writing desk, and numerous pieces of valuable art and antique furniture. Thankfully all of these items were removed and in storage when the building was targeted by arson in June 2008. The Mansion sustained major damage and part of the roof and the porch railings built in 1856 were destroyed by the fire. However, with the support of multiple state agencies, preservationists, history enthusiasts, and proud Texans, the Texas Governor's Mansion has been restored to the grandeur in which it was meant to exist. 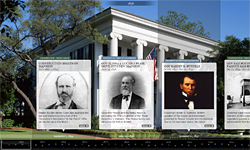 This premier historic home has served as the official residence of Texas governors and their families since 1856. It is the fourth oldest continuously occupied governor's residence in the country and the oldest governor's mansion west of the Mississippi River. Throughout the years, a wealth of colorful stories have come to life within this Texas treasure.